The reviews are in, Prusik peak is as good as they say. Chase and I climbed it last Thursday (7/20) via the Beckey-Davis route on the south face. I would summarize the route as sustained alpine granite fun. The following is a summary of approach/descent and a pitch-by-pitch recap of the climb. Hopefully this helps the next aspiring Beckey wannabe find their way up the route. Approach – we started from Snow Creek TH at 4:30 AM, got to lake Viviane by 8:30 AM, filled up our water bottles, and maneuvered around the east side of the lake to the base of the climb. We started climbing around 9:30 AM. Pitch 2 – (5.7?) We went far right from the belay ledge above the chimney and got into some face climbing and hollow flakes. Not great. Pitch 3 – (5.7) This is where the climbing gets good and the exposure starts. fun blocky climbing to your pick of belay ledges. This pitch would be easy to pass a party if needed. We didn’t have anyone else on the route with us. 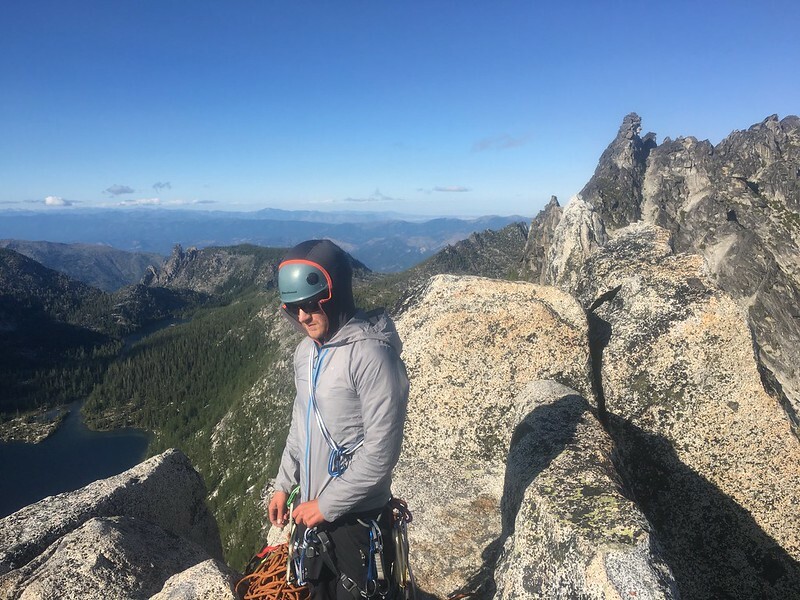 Pitch 4 – the Traverse (low 5th) – traverse down a steep step, then up another steep step to a tree belay, now you’re at the base of the crux pitch, but you could climb another 10-15 feet if rope drag is managed. Pitch 5 – the Crux (5.9) – super fun and positive laybacking in a right-facing corner, then a left facing corner which ends us getting really hard, at which point you have to make a step across to the left and easier climbin. Great pro. This route just eats big pro (1 to 4). 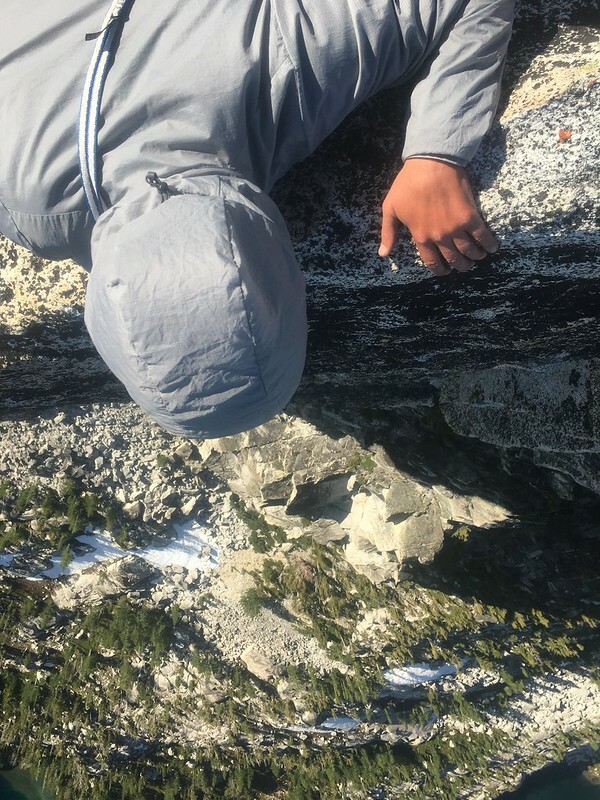 Pitch 6 – (5.7) fun climbing to the “notch” at the base of the true north summit. Pitch 7 – (5.7) a low-angle ramp on the north side of the peak will take you to the top! the 10a variation looks fun too but we were worked. Descent – Descend via the north face rappels (took us ~6 rappels with a single 60m). Then its a quick walk around to the base of the west ridge and one more rappel gets you to the south face. took us 2 hours from summit back to packs. Then a long walk back to the car. All in all is took us 21 hours car to car. Fun and exhausting day capped with Tim’s Jalapenp chips, the best there is. Great climbing Chase!